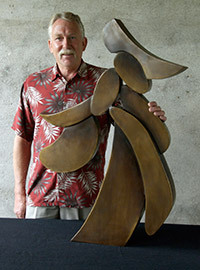 A diverse impressionistic sculptor, I design and build two- and three-dimensional hollow form and silhouette sculptures. As an artist, my work is an expression of my spiritual, emotional, and aesthetic responses to my experiences. My art is an intuitive and subjective reaction to my environment, making my designs bold and rhythmical. The use of color, buffed finishes and extreme attention to detail highlight my work. A professional sculptor for over 30 thirty years I specialize in one-of-a-kind, site-specific, collaborated commission work. I also design and produce limited editions. In 1966, I attended Eastern Washington University where I studied fine art and, after two years, I enrolled in a more structured program at Spokane Falls Community College. After receiving a design and advertising liberal arts degree, I opened Warrington Studios and Gallery in July 1971. After a couple of years painting, l moved into sculpture. In 1974, I completed a composite piece for King Cole, the initiator of the 1974 World's Fair, in Spokane, Washington. During the fair, Chris Kristofferson, a famous actor and musician, was interested about the high quality of my work. Talking to him provided me with a positive momentum that pushed me forward in my artistic pursuit for greatness! I closed my gallery in 1975. Since that time, I have created commissions for country clubs, resort hotels, hospitals, corporations, banks, colleges, churches, and businesses such as U-Haul and Tap Pharmaceutical. I have also worked with large developers. At this time, I continue to sell my pieces through major art galleries and design firms from coast to coast. My work has been collected by individuals, businesses, sculpture parks, and banks in the United States, Europe, Asia, South America and Canada. My work has been shown in Art in America, Art News, Art Business News, Sculpture Magazine, The Guild Book , Florida Design, Triangle, Palm Springs Life, Southwest Art, The Spokesman Review, Best of America Sculpture Artists (Vol. 2, Spring 2011), American Art Collectors (July 2011), Artist Showcase Magazine (Spring 2012), Cover of Artist Showcase Magazine Sculpure (Summer 2012). Art Expo NYC (13 yrs. ); Art Expo Las Vegas (2 yrs. ); Décor, Fort Lauderdale, FL; International Art Expo Florida; International Art Expo, Palm Springs, CA; 12th Annual Loveland Sculpture Invitational, Loveland, CO; Port of San Diego Sculpture Show, 2006 & 2009-11; Art On The Avenue, Wenatchee, WA, 2006; Westcott Bay Sculpture Park, Friday Harbor, WA, 2004-06; Experience Color Exhibit, El Paseo - Blvd., Palm Desert, CA, 2009-11; Preston Contemporary Art Center, Mesilla, NM, 2010; Red Dot Show, Miami, FL; Art Expo NY 2011; Red Dot NY 2011; Art on The Avenue, Wenatchee, WA 2011-2012; Coeur d'Alene, ID Downtown Exhibit 2011-2012; Mac Auction Catalog Spokane – April 2012; Art Currents 2012-2013; Coeur d'Alene, ID Downtown Exhibit; Art Market Hamptons – July 2012; Art Expo NYC, April 2012; Miami Solo, December 2011; Art Expo Chicago Fall 2012.